Earlier this week, after three days of scrubs due to bad weather, the Astro Pi payload (two specially cased Raspberry Pis, Sense HATs and lots of experiments coded by UK school children) was finally launched into space on Orbital Sciences’ Cygnus cargo freighter on its fourth resupply mission to the ISS. The precious payload is inside the nose cone of the rocket in the gif above. If you missed it live, you can watch the replay of the launch below. An Atlas V rocket in the 401 configuration has successfully launched the unmanned Cygnus OA-4 spacecraft full of cargo for the International Space Station today, December 6th 2015 at 21:44 UTC. This return to flight mission since the Antares rocket failure in October 2014 carries an enhanced Cygnus spacecraft with a larger cargo volume and new solar arrays, The craft will arrive at the International Space Station on Wednesday. 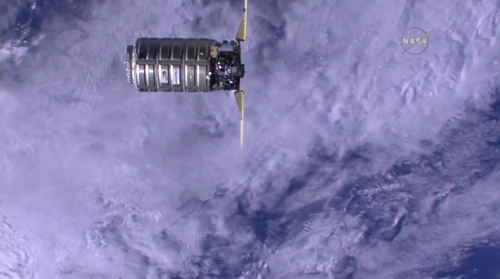 The Cygnus spacecraft is set to arrive at the ISS on Wednesday 9th December (this morning! ), with grapple operations beginning at 11:10 GMT. 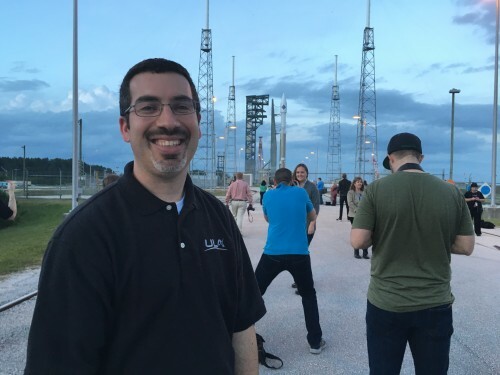 Matt Richardson, Jonathan Bell (jdb on the forums) and I were able to attend the launch at Kennedy Space Center (KSC) in Florida. In the days leading up to the launch, a group of us were given an in-depth tour of Kennedy Space Center. A lot of what we saw related to the Atlas launch, but we were also shown some of the long-term work related to the Space Launch System, which replaces NASA’s retired Shuttle program. We got an overview on how they test umbilicals for the new rockets in the Launch Equipment Test Facility, walked around inside the enormous Vehicle Assembly Building, which is being retrofitted for SLS, and went inside Boeing’s facility to see the progress on the CST-100 Starliner crew module for commercial crew missions. After the rocket was in place on the launch pad, we returned to take a few photos. It was quite incredible to think that two Raspberry Pis were loaded up inside the Cygnus spacecraft, ready for their trip to the ISS. It was at the launch pad where I met Matt Donovan, Human Launch Services Propulsion System Design Leader at United Launch Alliance. I was eager to tell him how excited we were to have cargo on this launch. “Thanks for the ride,” I told him on behalf of all of us in the Raspberry Pi community and for the students with code on-board. 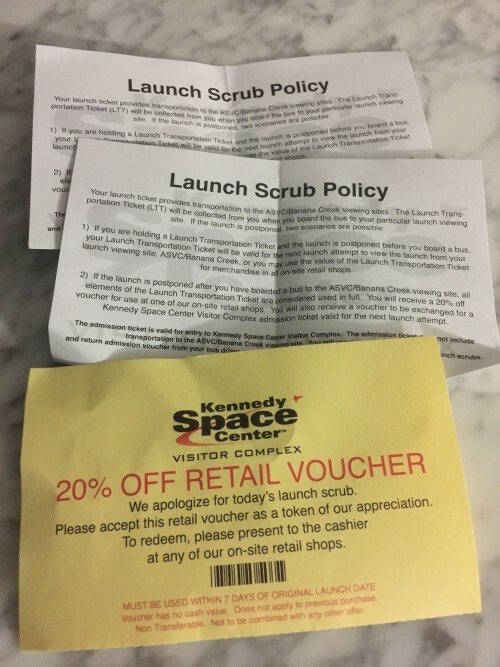 While Matt was doing that, Jon and I just bought domestic passes to the KSC visitors’ complex. If you’re ever in Florida I highly recommend paying this place a visit, regardless of whether a launch on. There is nothing quite like seeing actual spaceships that have been in actual space! 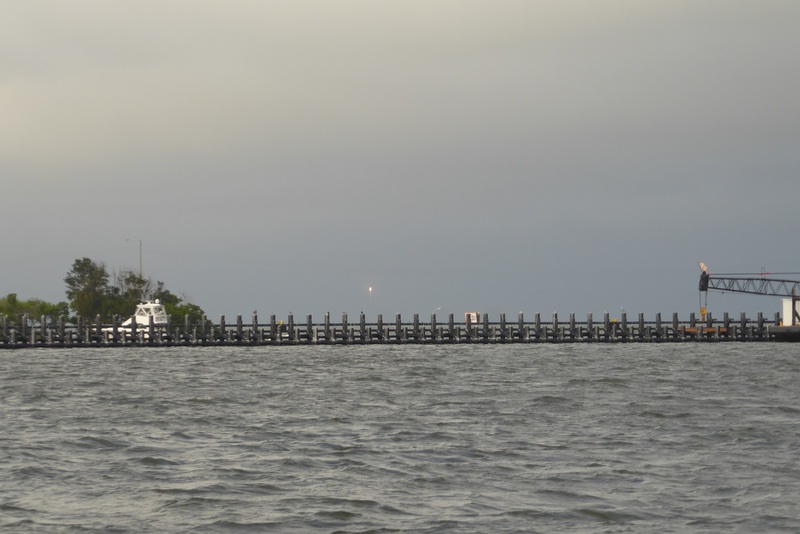 KSC provides a bus service that transports you out to a restricted area called Banana Creek where all five of the main launch pads can be seen at a safe distance. There are a number of bleachers (tiered benches) for people to sit on. When Jon and I arrived for the first launch attempt on the 3rd we were both excited and wired. However over the course of several hours the weather deteriorated. The Atlas V rocket was on launch pad 41 and at one point we couldn’t even see it because of heavy rain. Jon and I were pretty damp ourselves, both physically and in spirit, by the time the launch was finally scrubbed. The next day we came back to Banana Creek and convinced ourselves things would be different. The weather was glorious sunshine. This time the launch attempt got all the way to the terminal count; but we heard the fatal words “flight is no go” again and again, due to ground winds throughout the 30-minute window. 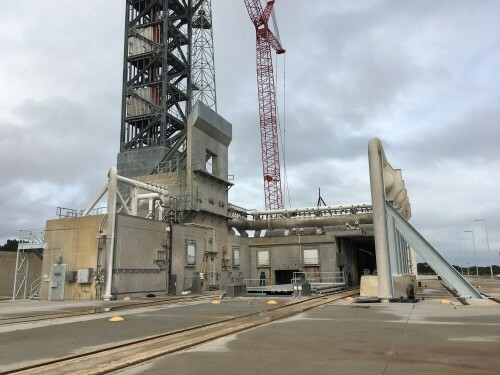 If ground winds are too high, there is a risk that the rocket could collide with the launch tower as it comes off the pad. So, once again, we were scrubbed for the night. On the 5th the wind was so high that people were out kite-surfing on the beach at 9am, and with no sign of it abating the launch was scrubbed hours before the 30-minute window even arrived. Our flight back to the UK was the following day and, with only one chance left, we doubted that we would see it lift off at all. We wouldn’t have enough time to get the bus out to Banana Creek and back, so we made a plan to watch it from within the grounds of KSC visitor complex and then make a dash for the airport. This was only about one more mile away from launch pad 41. As if things couldn’t get any worse, our plan was defeated when the KSC visitor complex had a mains water failure and had to close. An announcement came over the loud speaker asking everyone to leave. Houston, we have a problem! Due to a water main break, the #KennedySpaceCenter Visitor Complex has closed until we can resolve the issue. At this point we felt that the universe was against us, but we refused to give up. 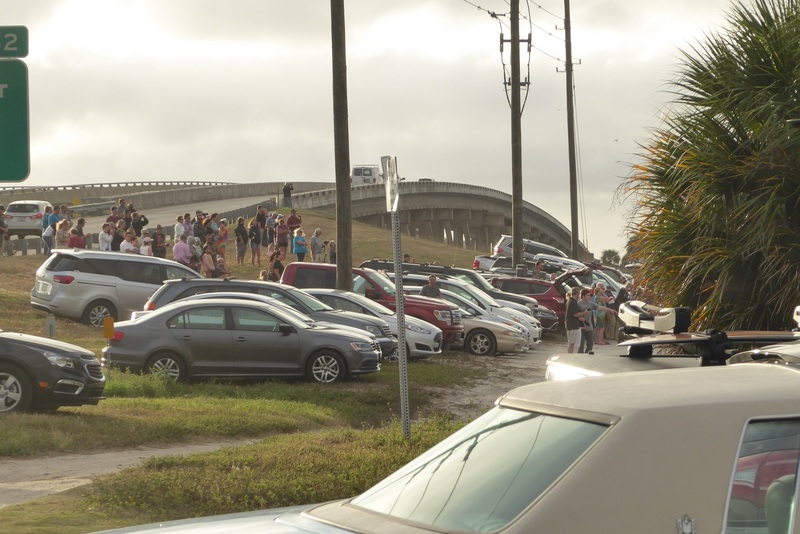 We checked online for places to view from and drove like madmen to the A1A bridge across the Banana river, where there’s line-of-sight to the NASA vehicle assembly building. We had no way of getting updates because there was no WiFi there, and mobile data was being charged at £6 per MB. So we befriended some locals and listened in to their phones. We only saw the booster flare for about three seconds before it then disappeared into the clouds. About 30 seconds or so later, the noise arrived: a brilliant low thundering rumble building and building before slowly fading away. Jon and I looked at each other and almost in unison said “Bon voyage little Raspberry Pis!” We then leapt into the rental car and headed for Orlando airport to catch our flight home. It was a hectic few days, but well worth it to catch that glimpse of the rocket taking off. Matt, Jon and I are eternally grateful to Eben and Philip who sent us on this journey! I’m so glad you got to see the Pis take off, even though it had to be at a distance! The NASA Social organizers kindly arranged a great viewing location for us on NASA Causeway and invited us back for each launch attempt. As Liz said, because of some previous commitments, I had to leave Cape Canaveral before the delayed launch happened. I ended up watching it live on NASA TV on my plane’s wifi. But no complaints from me; it was such an incredible experience. It appears that watching space launches is “addictive”…the bigger the launch vehicle the more exciting. The late SF author Poul Anderson and his wife got hooked on watching Saturn V and Shuttle launches. 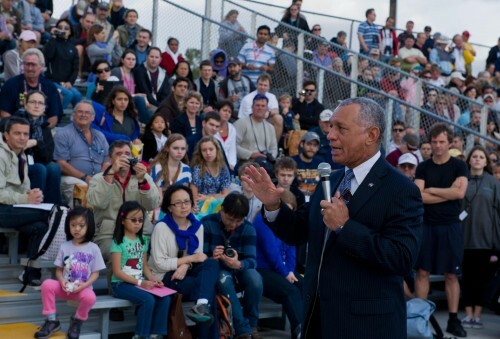 Anderson got vetted as a “reporter” for his very small home town newspaper, which got him into the press stands, which are the closest ones to the launch pads. Raspberry Pi micro satellite !! What a crazy story – the sort of thing you couldn’t make up! Glad to hear it all went well in the end. There’s even some slow-motion video of the rocket just as it was taking off at the end that’s very pretty to see. Astro Pi is in space. These things will start powering the entire world soon. As an Electrical Engineer I spent part of 1958 and 1959 “down range” as part of a program called “Gaslight” and during those launches I could hear the countdown sequence,”…telemetry, GO, propulsion GO, range safety GO,…” Watching the launch of the ISS supply payload containing the Pi’s and hearing the countdown brought back long forgotten memories and some barely suppressed tears. I couldn’t help shouting at the TV, “Go Baby, Go!” all the way to MECO. My neighbours must have wondered what was going on. It is too bad that you couldn’t have been closer to the launch to experience the real sensory overload..think, the opening sequence of Top Gun, multiplied by a 100 or more. My hat’s (actual hat, not HAT) off to all of you students, teachers and supporters to be able to be a part of this program. May you never forget it!! Looks like the launch went pretty close to right over the factory where the Pi is made and Cambridge where it was designed. How appropriate! Congrats to all. If your mission was to get kids interested in computing, you have succeeded beyond your wildest dreams. You even woke up the long ago memories of my excitement learning to program on an Apple ][. The Pi inspired me to advise a local school robotics club and get into the hardware again. All those kids are now in college studying Computer Science and Electrical Engineering. Thanks for the new memories! The Astro Pi flight hardware launch is tonight!